The VOV campaign envisions a global movement of ordinary people becoming the driving force for building the culture of peace through dialogue and action in their daily lives. To inspire people, especially young people to identify and counteract the root causes of violence in their lives, homes, schools, and local communities through awareness, introspection, individual empowerment and a creative commitment to dialogue and action. But, it’s especially for anyone who has ever thought that they couldn’t make a difference. If you haven’t given a lot of thought to how you could contribute to reducing the level of violence in the world and want to learn more, we are here to help you learn about the issues and get involved at a pace that works for your lifestyle. 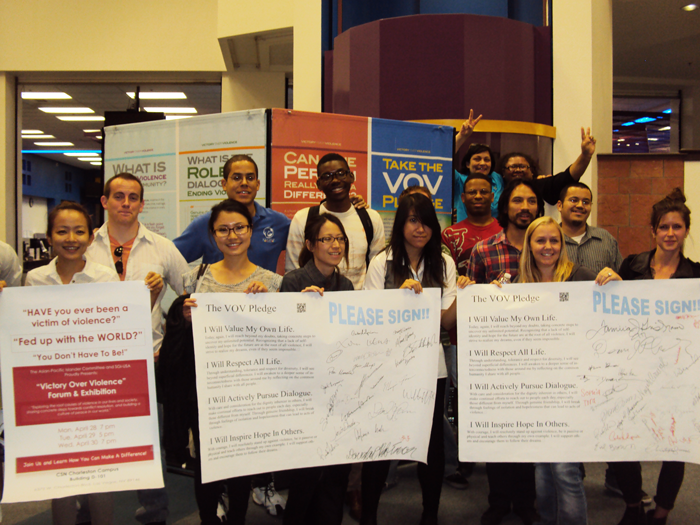 The VOV campaign is for anyone who believes that the world should be less violent. Every day, amazing stories of victory over violence take place. If shared, these stories have the power to inspire change in countless others. VOV.com is the central hub for sharing them. It’s an online resource where you can discover a lot of powerful information that will capture your interest in ways ranging from heart-warming to thought-provoking. You will also find several fantastic ways to get involved, show your support, and encourage your friends to make dialogue and action for nonviolence a daily practice. Share a personal story of how you achieved Victory Over Violence and are making a difference.